What: Quill.com, an online business and medical product marketplace for small-and medium-sized businesses and subsidiary of Staples Inc., now offers Star Wars wrapped copy paper just in time for the holidays. 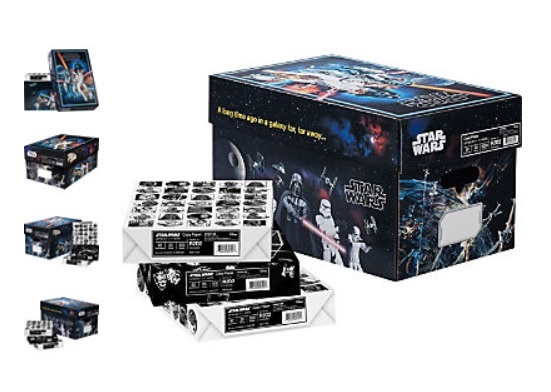 Each ream of paper is wrapped in an eye-catching Star Wars design and comes packaged in a reusable Star Wars themed box that can transform into a collector’s item or poster for a fan’s workplace or home office. The Star Wars wrapped copy paper reflects Quill.com’s innovation in using pop culture to create an office product that energizes and excites fans. Exclusive to Quill.com, the Star Wars wrapped copy paper features the iconic characters from Star Wars: Episode IV A New Hope. The copy paper is available for pre-sale now, and will be available widely beginning Monday, November 21, with a suggested retail price of $39.99. For more information, please visit www.quill.com/StarWars. Thank you to Quill.com for the press release and the images. Next article The Sith Are Unleashed This February in STAR WARS: DARTH MAUL #1!